In any case, whatever its name, it is delicious served on its own on toast as a snack, or with a side salad as a starter. As a paté, it’s low-fat because there is no added butter or cream. It’s essentially boiled chicken. Start off by making a chicken stock as per my earlier recipe. Make sure you under-salt it as the reduction process will make your terrine very salty otherwise! As an additional INGREDIENT, you will also need some fresh Dill and some additional Flat Leaf Parsley. Once you have made the stock and removed the vegetables and herbs, return it to the heat, leaving the chicken pieces in it. Leave the lid off and turn the heat up slightly so that the stock is on a gentle boil / high simmer. You can stir it occasionally to encourage the chicken to fall off the bones and shred itself. Once you have reached that stage, turn off the heat and carefully remove the bones (they’ll be completely clean of any meat by now) and any bits of cartillage you can find (personally, I love cartillage, but it’s not to everyone’s taste so it’s probably best to remove it…it will have come clean off the bones and meat, too). Leave to stand until it’s at room temperature, then stir in roughly a handful whole flat-leaf parsley leaves you have previously torn off the stalks. 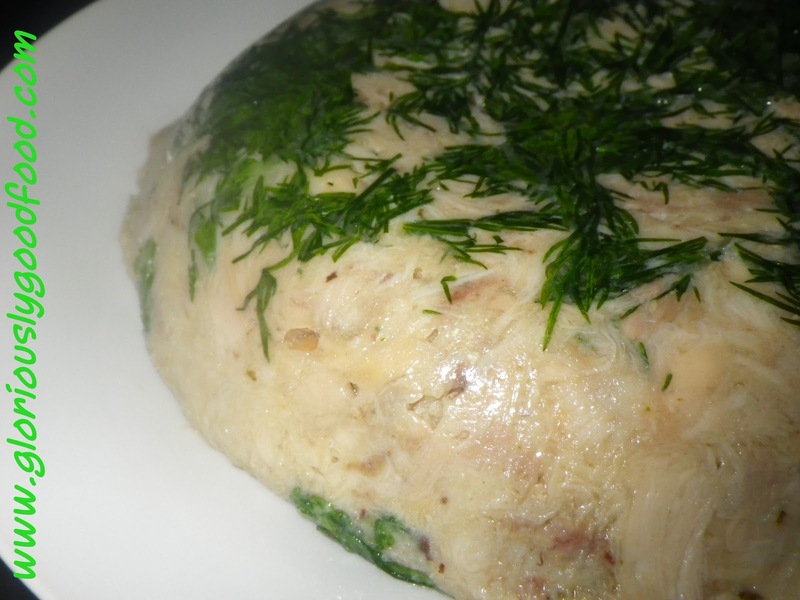 Place a large piece of cling film into a bowl (or whatever shape you want your terrine to be). The cling film should generously over-hang the edges of the bowl/container. Sprinkle a generous amount of chopped fresh dill into the bottom of your container lined with clingfilm. Place your chicken and remaining stock carefully over the dill, making sure the dill doesn’t get mixed in. Then press the mixture down quite vigorously with your fingers. 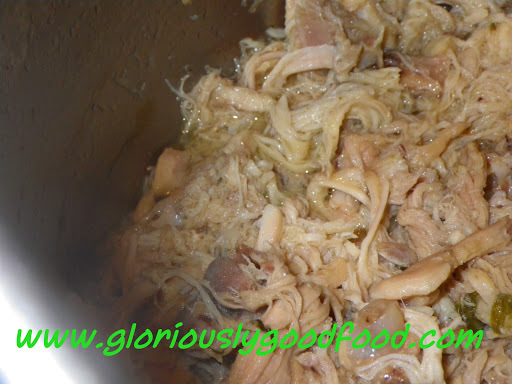 Fold over the cling film so the chicken and stock mixture is completely covered and press down, vigorously, again. It is normal for some stock to rise to the top at this stage…this is a slightly messy process and you really need to get involved, putting some pressure on with your fingers/hands! Place a weight over the terrine, then place the whole thing in the fridge. Leave to cool, ideally overnight, for the terrine to fully take its shape and go slightly solid. When you’re ready to serve, open up the clingfilm at the top (which will become the bottom), place a plate over the top and flip it over, then remove the bowl and finally the clingfilm. You should have a beautifully shaped terrine, ready to be sliced and served! 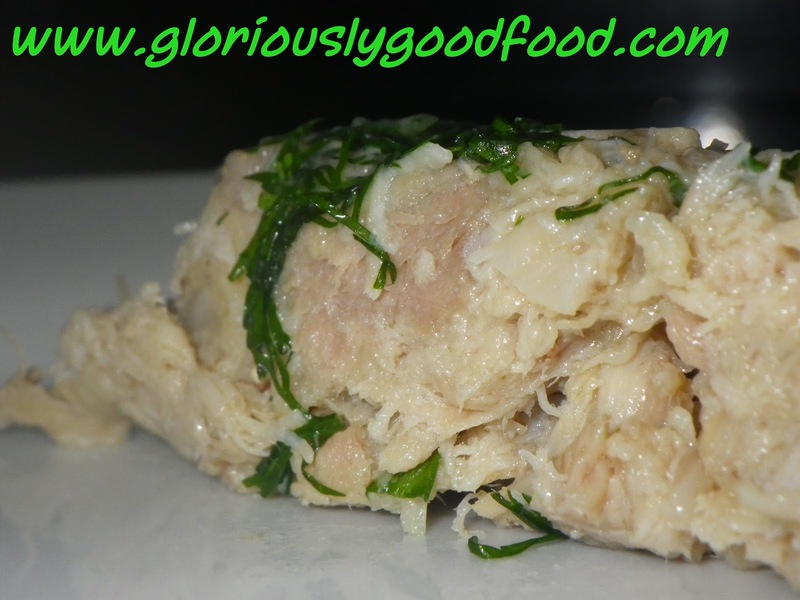 This entry was posted in Chicken, Low Fat / Low Cal, Meat & Poultry and tagged chicken paté, chicken terrine, chicken toast-topper, low-fat chicken paté. Bookmark the permalink.